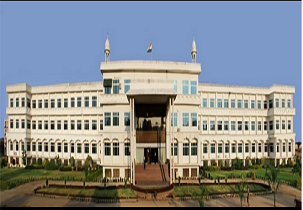 Mewar University (MU) has the vision of developing into a Centre of Excellence for vocational, professional and technical education including research as per the international and national standards. The university provides the students with research driven environment with market based orientation. The mission is to develop framework for conducting research and educational programs to produce self-reliant and confident youths for the society. The university provides the students with easy access for higher education in engineering, management and other fields. The students are provided with industrial exposure in order to improve fresh vision, new ideas and face the challenges in the business world. The university provides choice based credit system of education which helps the students’ different modes of learning. The placement cell of the university conducts various personality development programs for making the students entrepreneurs of the future industrial sectors. Tech Mahindra, Infosys, EMC, IBM, Hitachi, Simplex, Coat, Birla Gold etc. are some of the top recruiters who visit the campus every year. The average salary package offered to the students who are placed in good organizations is nearly around INR 1.5-5 LPA. The hostel rooms are ventilated and spacious with all the basic requirements to satisfy the needs of the students. Canteen is present within the hostel and provides tasty and hygienic food as per the demand of the students. The candidates have to score good rank in the entrance exams like GATE for M.Tech courses and for MBA the exams like GMAT, CAT and XAT have to be cleared. My college is considered to be the pride of Chittorgard district in my state. I had a good start to my career because of this college. Faculty members are very friendly and approachable to the students. They guide the students with skillful knowledge. Hostel facilities at this institute are excellent. My entire college life was spent in hostel and the quality and maintenance of the hostel is remarkable. Placement at this institute is good and many top companies come to this college for hiring students. Are you Interested in " Mewar University, Chittorgarh"? Please provide the following details.